Since we launched our show "Jen and Barb, Mom Life" more than four years ago, the number one question moms have asked us is, "How did you guys do that?" The subtext was not about producing and hosting an award-winning web series, but how did we reinvent ourselves, especially given our roles as mothers, wives, and career women? Over and over, moms confided in us, sharing their frustrations, fears, and dreams. How could it be that so many of us who had always dreamed of having a family were feeling like something was missing? What was a mom to do? REINVENT! Through the journey of our own reinventions, we discovered the Mom Secret: The more satisfied you are with yourself, the better you can deal with the chaos that surrounds you, the better role model you will be, and the better off your entire family will be! This is not a luxury. This is a necessity. 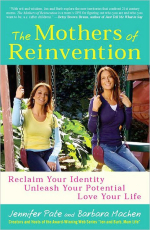 In The Mothers of Reinvention, Jen and Barb share their steps to help you realize your full potential as a woman while still maintaining your joy as a mom and/or wife. Whether you're a new mother, a mother of school-age children, or an empty nester, Jen's and Barb's personal stories, in addition to accounts from other women who have also reinvented, will engage, inspire, and motivate. Every mother deserves passion outside her family, and The Mothers of Reinvention will help you discover what that means for you!